We all have things that we are passionate about. When you have an appreciation for something, you want to share it with the world. One of my many passions is Fashion, I adore shopping and get so excited when a new collection of clothing is coming out. I love to bring my fashionista side out by putting together outfits and adding my own personal style to them, Fashion is so much fun! Besides blogging about Fashion how else can you showcase your favourite pieces? How about hosting a Cupcake Party like I did? Snapfish allows you to create your very own personalised coaster sets. In love with an outfit and want to show it to everyone? Simply upload your photos and make your DIY Coasters, easy peasy. You can also use Snapfish to print out your outfits. Placing them on the table will allow everyone to start discussing their own Fashion tastes. Cupcakes, Champagne & Fashion talk equals a perfect girly evening! Don't forget to order your party invitations, Snapfish have so many different cards to choose from for all occasions. 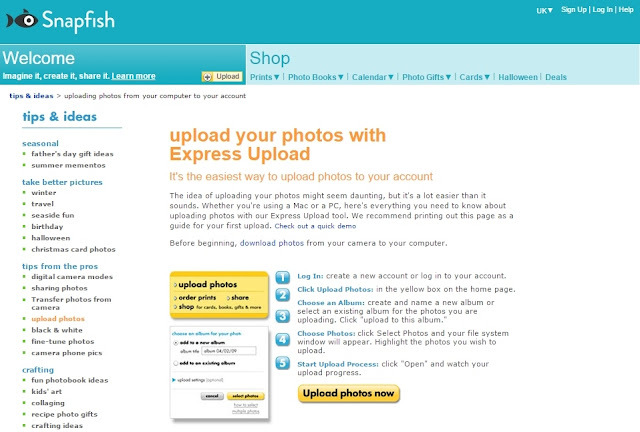 Here's an easy step by step guide on how to upload your photos. Use code CARDS1015 for 40% off all Cards. You can also use code SFUK436 for 40% off all Coasters. Pretty cool hey?! A big thank you to Snapfish for the gift voucher! Have you ever used Snapfish before? I'm a huge Snapfish fan. I've been using them for years for everything from picture books to other accessories. I have been a Snapfish customer for years, but for the photo books. I order them from there every year for my mom for her birthday and xmas. Custom coasters are a great idea! There are so many possibilities ... I love yours, they look amazing! I have to say I've never tried Snapfish but it looks amazing! I have so many pictures on my computer right now that I need to do something with - I'd love to make a photo book! Snapfish sounds like a cool site. I have a few pictures that I want made into coasters. I am heading over there to check their packages. Thanks for writing about this. I love snapfish! Any way I can get my photos printed without leaving home makes me super happy! I am a fan of Snapfish. They are a great photo company. I'm loving your tea party. Your tea pot is gorgeous. I have a snapfush account and I love that company. I usually order photo prints from them. 40% off? That's awesome! I used to purchase from SnapFish all the time. I have to check them out again. I have never heard of snapfish before, thank you so much for sharing! Also thanks for the guide- it looks pretty straightforward to use which is awesome! What an awesome party set up! Love the bubbly. Cheers! YUM! I did use Snapfish before to order a custom photo mug. Those cupcakes are making me hungry, love the way the frosting looks.